After several years as a graphic designer and the owner of an antique business, Linda O'Boyle created the lifestyle boutique, Metro Home Style located at 689 North Clinton Street in Syracuse, NY. Open since 2006 the store offers a carefully edited selection of home accents, accessories and specialty items, including many fair-trade and made in USA gifts. 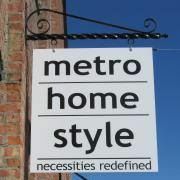 Metro Home Style is dog friendly and customers enjoy complimentary gift wrap, a value-added rewards program, free local delivery, free shipping for web orders of $35+, a full calendar of store events, and the coffee is always on! Linda's creativity in merchandising, community involvement, and innovative marketing proudly earned the store two listings on Home Accent Today magazine "50 Retail Stars" list, and on Gifts & Decorative Accessories magazine list of "25 Gifted Retailers."